I am using SOATest (9.9) and in my JSON response I am asserting on an element (status) which can have a value or null value. I am trying to assert this against my datasource column 'status'. 1) Added a Value Assertion for the element 'status' and parameterized it to refer to the data source spreadsheet column. 2) Added another Fixed Value Assertion for the element 'status' and added value as blank and saved it. 3)Added a Conditional assertion and added the Assertion #2 to my "If Assertion" section and then Assertion #1 to "Then Assertion" section and saved it. When I run the test its ignoring this above assertion and passing my test everytime no matter what I give in the status column in my datacolumn spreadsheet. Am I doing something wrong here ? Does an empty element represent a null value or no element in the response? If no element in the response in the response represents a null value, you want to use Occurrence Assertion. If no value in the element represents a null value, you want to use Has Content Assertion. Please let me know if this helps. 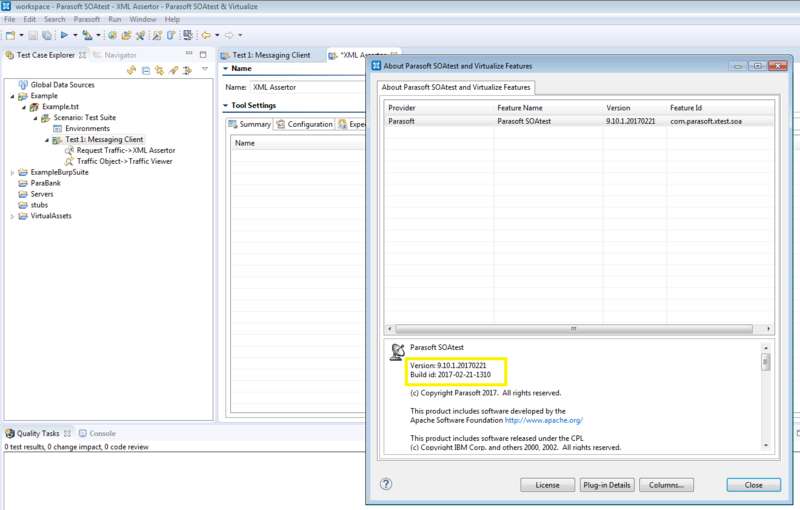 Has Content Assertion../status could not be located or did not contain text content. This is the error I was getting when I was using value Assertion too. Hmm that's strange. I'm able to use the Has Content Assertion parameterized against a column that has the values true or false, and it does what I expect. What is your build id and full version? My datasource column 'status' has a valid (non null) value for first row/ scenario. For the second row/scenation the column has blank value. This is where SOATEST is failing with "Has Content Assertion../status could not be located or did not contain text content." I want to know which assertion to use to assert for blank/null values in the response . Does anyone has any update on my question? Appreciate your help! 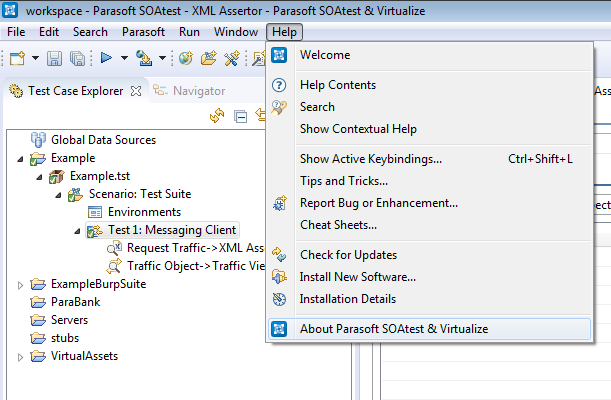 could you post your Xpath from JSON Assertor? Could you also publish your tst file? Just attach it to this thread. My scenario is I am expecting blank value for 'status' element for one of my scenario and I expect my test not to fail if it returns blank value and how do I handle through assertion? So I am asserting my 'status' element in the response against 'status' column in my datasource sheet and this datasource sheet has 2 rows/scenarios. For the first scenario, 'status' (expected value for 'status element) column has a value 'PEND' and when SOATest runs this scenario then the test passes as the 'status' element comes back with 'PEND" value . 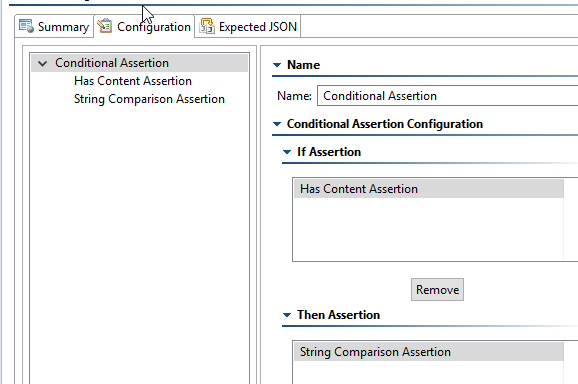 For the second scenario,'status' column has no value in the datasource sheet and when SOATest runs this scenario then the test fails saying '"Has Content Assertion../status did not contain text content." because the response had blank value for 'status' element. How can I have an assertion against an element which will work for both null/blank and non blank values ? Could you check if following assertion works for one of your cases? Do not parametrize it at the beginning. Has Content assertion expects to get true or false, so in your data source you have to add column which contains true or false for particular case, and then parametrize it in JSON Assertor. If you want to create assertion to check content and also validate the content itself, you have to add Compound Assertion. Well this compound assertion will work for my my first scenario where my element has a non blank value but it will fail for the second scenario where my element doesn't have a content/ or comes back blank. But I think you have to check Has Content assertion in IF then check the value. Has Content should be set with data source as true or false. The column which you want to use in parametrization in Has Content should contain true/false. Could you please attach your tst in this thread? Conditional assertion doesn't work for me as its simply ignoring the Then and is always passing my test, which is what I have said in my intial question. I think its a bug with Conditional Assertion in SOATEST where its passing the assertion always without looking at the Set if and Then Clause. the condition is a combination of previously-defined assertions). Thanks Ireneusz. I had already tried this approach but the problem here is , its not actually asserting for non blank values properly. So in your example, for the value of test column 'My' if response has 'xyz' then also my test is passing , which shouldn't be the case. I agree Conditional assertion is taking care of not failing when its coming across blank values for 'status' in the response but at the same time its not truely asserting on the right value . For ex: if you change value of 'test' column for row#1 to '123444' and then run the test it will still pass. I hope am not confusing you. It would extremely helpful if you could provide a sample .tst file to demonstrate where your current hurdle lies. Please attach a sample .tst file so that we can reproduce the behavior and give you some additional insight. Save the traffic in the traffic viewer! As OmaR said, please share tst and we will help you with your case. The only reason I was hesitant to share the tst file was because I had framed the scenario/question in simplistic way than what actually the real tst file is doing. Anyways I've attached the sample tst file and the excel sheet which its using in the Data source . 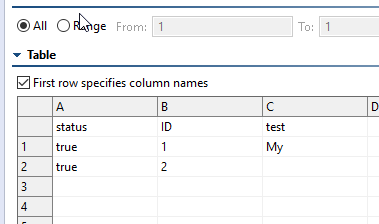 Also in my tst file, I am trying to assert on 'statusCode' element(referred to Status in the earlier contexts) for different values of 'ExpectedIPList' column(maps to 'name' element in the response) .Also I have Status column as suggested by you which has 'true' value. Hope this helps to understand my problem better. No problem I approved the original post, but when I saw that you added in the stuff in two separate posts, I deleted the original. No harm done! I have attached slightly changed tst. I have changed xpath used to extract values from response. It works in my environment as I'm using column requestUrl to iterate over your datasource. I think that we have misunderstanding in this case as I think you expecting to use assertion with parametrization for any request ( let's say without order). So the only change you did in your attached zip file was to change the xpath query. I followed the same and did that change to remove parameterization from my Xpath (like you did ) and then ran and still it passed instead of failing for ExpectedStatus value as '123'. Also I anyways have to use parameterization to assert for the statusCode for a particular ExpectedIPList column value. I am not sure where am going wrong. In Traffic Viewer you should have a response from server with JSON for both request. Compare that responses with Xpath. Thanks, I created a case # 00061565 in the support site. Please make sure that the XPath for "has content" assertions point to an element and not to the value of the element. Would return the entire element "a"
Has Content assertion expects an element not a value. Did you got a proper response to your problem? I am trying to do the same. How can we assert against a datasource blank value and make sure the response has a blank value? The provided solution only assert a value if it is not blank but does not confirm that that expected value is blank.